As smartphone cameras advance, offering features that rival and sometimes exceed the point-and-shoots of old, hobbyist interest in photography has surged, not only for documenting friends and family, but for recording a critical world view—similar to classic street or landscape photography. When Apple posts billboards of scenes shot by amateurs and pros using their iPhone, it’s not hard to see where the inspiration comes from. 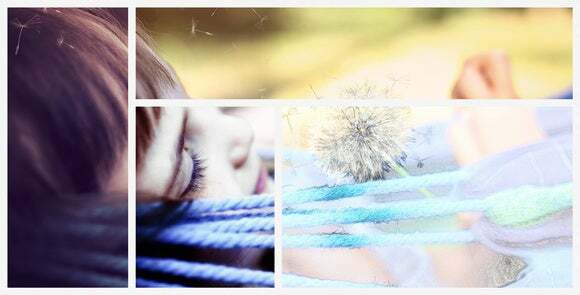 For those who want more visual tricks than Apple Photos offers (especially for composition and special effects) they turn to Adobe Photoshop Elements, an app designed for consumers who seek an easy way to achieve sophisticated special effects. Elements, now in its 15th iteration, is no Photoshop, but a good number of its advanced features are derived from the company’s flagship app and namesake. Adobe is wise enough not to mess too much with the basic formula and general interface of this app, preferring to enhance and add to its features. With version 15, the updated Organizer companion rocks brand new search capabilities and batch processing, while a new crop of guided edits refresh the main editing package. The Adobe Elements Organizer, an analog to Photoshop’s Bridge, acts like a mini digital asset management system, keeping track of all photos and videos to make them accessible to the two main Elements apps, Photoshop Elements and Premiere Elements. Aside from import/export and organizational functions like ratings and tags, the Organizer features face recognition, geo-tagging, and built-in maps. The Organizer is also the place for basic fixes like rotation and auto-correction. In version 15, it does a lot more. The Organizer now has more intelligent capabilities, like its new Smart Tags feature. From the search interface you can see exactly what tags the app has placed on your images. Google Photos, Flickr, and Apple Photos already use artificial intelligence to automatically determine content for tagging photos. Adobe says that deep learning algorithms were used to develop the Smart Tags feature, but that there is no on-going AI technology running in the Organizer. 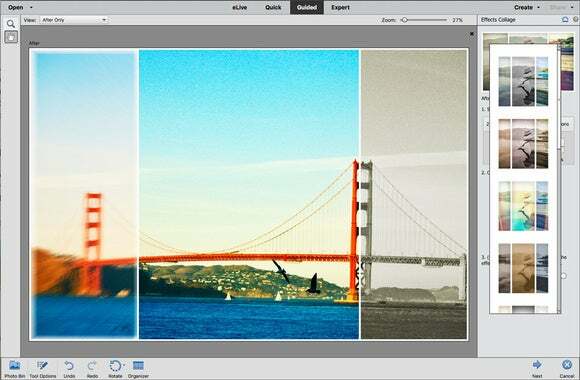 Photoshop Elements Organizer Smart Tag and visual search interface. You can use the app’s enhanced search functionality to quickly scroll by Smart Tags, People, Places, Date, Folders, Keywords, Albums, Ratings and Media Types, whose icons run down the left side of the window. You can choose from the icon or just type in search criteria in the box at the top of the window. You can use the And or Or command to narrow down your search from thousands of images, video, audio, and projects to find the item you want. Note that each smart tag search builds on the previous one, so make sure the text box at the top reflects only your current search. Type in or use Smart Tags to combine or exclude keywords in your search. The Organizer’s new Instant Fix update now lets you batch correct photos imported into the app. Just group together your chosen shots, and the new interface offers a set of adjustable sliders to fix them all simultaneously for clarity, color, light, brand new special effects, and more. New batch processing in the Organizer. 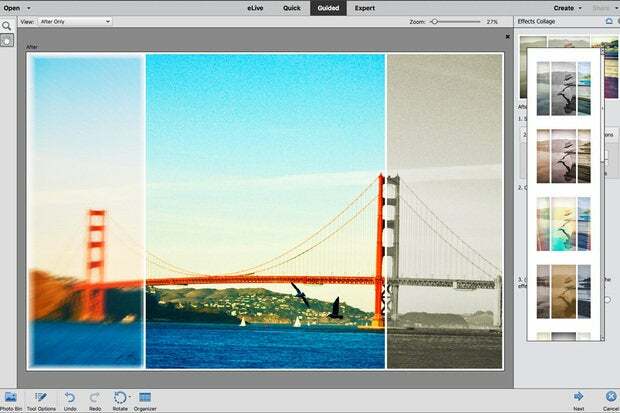 Adobe’s famous Quick, Guided, and Expert editing modules lie at the heart of the Photoshop Elements Editor, making it the go-to app for amateurs seeking a more sophisticated but accessible alternative to Apple Photos. This new version debuts five new guided edits to perform complex tasks via step-by-step instructions. In this version, however some were better than others. While it can be a fairly straightforward task to accomplish that beloved classical postcard effect of filling in lettering with a landscape or other images, you need the proper tools and know-how. Elements’ new Photo Text guided edit makes it drop dead simple to achieve. The feature lets you choose from the fonts within your system and even lets you add an embossed look and drop shadows for a pro finish. Pick from your own font collection; fat ones work best for stuffing in pictures. Put a photo inside your text for that old-time postcard look, or maybe a Springsteen album cover. Just choose the Type tool and start typing. You can select and cycle through all the selections to help you decide. After you choose your font, you can enlarge, fit, and apply some simple effects. Occasionally, this feature had glitchy performance; I’d choose a font and start typing without it registering any letters on the canvas. In that case, I cancelled and started over to achieve the advertised results. Creating art from photos is swiftly becoming a worldwide phenomenon. Photoshop Elements’ new Painterly module offers a nod to that by letting you add a canvas background or watercolor brush strokes to your photos. There are only five brush styles, but you can change their size and background color to alter the look. The module is aided by a minimal number of textures and effects. Original photo art: Mask your photo, use textured brushes to reveal parts, layer texture in the background, and top off with a filter. I found this effect a little half-baked. It’s understandable that Adobe wants to keep the tool simple, but in the future, I’d like to see more enhancements with additional brush shapes and textures as well as better ways to blend them. The new Effects Collage guided edit allows you to construct an artistic presentation by carving up a single photo into several sectors, automatically adding a different special effect to each one. It’s an intriguing idea, but not every photo will lend itself to the limited number of effects combinations offered. It would be nice if you could adjust the borders yourself, though there were quite a number of selections to choose from in each preset. It would be great choose which effects go where rather than just having to use the built-in template. But that’s a minor quibble with this cool feature, which dresses up mundane pictures in a pleasing way. I also noted that this feature caused the fans on my Mac to whir, and that the application of the effects was not instantaneous. Three special effects in one. Say you don’t know how or were unable to catch a cool motion shot? Or maybe the scene should have had more action than it really did? The new Speed Pan guided edit adds a motion blur behind your subject to create a feeling of movement. Just select the subject and let the software do the rest. A National Park Service horse carries a ranger through Central Park. Photoshop Elements always shipped with many assets, including picture frames for scrapbookers and blog posters. Version 15 gives you Frame Creator, a new way to create your own custom frames instead of having to choose the app’s pre-made ones. The idea is to give users headroom to expand the capabilities of the software without having to use the built-in artwork. These new frames can be saved in the app’s frame format and used with any photo, plus you can share them with friends. Why use built-in frames when you can create and share your own unique ones? I found this to be one of the least intuitive guided edits. Despite the instructions accompanying each frame tool, the outcome was hard to visualize and involved too much experimentation for a reasonably quick result. It would have been easier had Adobe included some shapes in this module with ways to tweak the edges instead of depending on user sleight of hand. Photoshop Elements’ new Adjust Facial Features tech first originated in Photoshop Fix, and then migrated to Photoshop CC as the Face Aware Liquefy feature. Making faces look friendlier has come into vogue for everything from social media portraits to group shots and selfies. While I’m not a huge fan of enhancing people’s faces, some photos do benefit from that slight transformation of a neutral expression into a smile. But that’s not all you can do. Smiling face looks pretty natural, when nothing but a smile will do. You may want to correct a squint that goes with that frown, or otherwise make slight cosmetic changes to lips, nose, and even the shape of the face. But don’t go crazy, because applying these effects can distort the natural looks of your subject. While the defining blue circle does not move and you can’t resize it—and on at least one image I tried—it cut right in the middle of the face, enlarging the image helps to rectify that issue. Also it would be helpful if each eye could be adjusted separately, as squints (and faces) are not necessarily symmetrical. Filters are a great way to try on new looks for special or not-so-hot photos, and an updated Filter Gallery not only lets you choose a cool filter but also fine-tune the details. You can easily try out each filter by clicking it, where it will apply directly onto the open photo, and then use individual controls to tweak. While the main filter was applied in real time, the advanced filter sometimes appeared in a small preview box that was harder to see. Adobe Photoshop Elements 15 is a mature product that gets new and enhanced features on a yearly basis while keeping an elaborate and engaging interface consistent and easy to use. If you are a photo enthusiast who seeks special effects goodness without the learning curve, Photoshop Elements is the ticket. While I found at least two of the new guided edits less than compelling, improvements to the Organizer were uniformly useful. For the very most part, Photoshop Elements 15 performed well without lag time on most operations, but occasionally I encountered glitches or intermittent buggy behavior. Adobe says that it recommends Elements for macOS Sierra, and despite a crash here and there, the app functioned as expected. You can purchase Photoshop Elements together with its video-editing companion, Premiere Elements, for $150 (Adobe online store link), or buy it alone for $100 (Adobe online store link). A free 30-day trial version is available. If you have version 14, and the new guided edits are not compelling for you, it would be an easy call to wait it out until next year to pay for an update. The upgrade policy is always the same: Any user with a previous version can upgrade for $80, or $120 for the bundle. If the new guided edits are something you will use frequently, or you have not upgraded for several iterations, you will be happy enough with the new version to lay down some cash. If you are a photo enthusiast who seeks special effects goodness without the learning curve, Photoshop Elements is the ticket.